The war is over. Troy has been looted and burned. A valiant Greek warrior whose name has been lost to posterity and so will be designated as X, loads his ship with treasure, hoists the sails, and sets a course for home. The sea is calm and the sky blue except for wisps of smoke from the smoldering city. He has been fighting here for ten years and is anxious to return, to see his wife and children, to once again set foot on his native soil. The journey proceeds without incident. All he has been longing for all these years is about to come to pass. In a matter of days the jagged cliffs of their familiar shore will come into view, and yet X feels terrible misgivings, as if behind the apparent ease of his homecoming the gods are leading him into a trap. His crew notices his anxiety and begin to suspect that they have been driven off course. This is followed by mumbling speculations of evil omens, or of impious words or deeds which might have reached Olympian ears. An old sailor suggests a sacrifice to appease Poseidon, or whichever god happens to be angry with them. They look around for an offering but unfortunately there are no women or children on board, and the mere thought of throwing their looted gold into the sea strikes them all as blasphemous and counterproductive. Before they can settle on an answer they reach their destination. They shrug their shoulders, greet their families, and forget altogether about their now groundless trepidation. Only X still appears apprehensive, all the more so when everything seems to be going well. His wife loves him, his children shower him with honor and respect, the harvest is plentiful, and he has ample opportunity to regale any willing listener with tales of heroic battles. As the years pass word reaches him of his former comrades in arms. Most have returned to their former lives, a handful didn’t survive the journey home, and only a few are unaccounted for. These last mentioned cause him nights of sleepless torment. He is well aware that this isn’t out of brotherly concern. Hearing of their deaths would leave him indifferent, even relieved. But then why should their unknown whereabouts affect him so painfully? He truly doesn’t know. Eventually, his life comes to an end and he is welcomed among the heroic shades. Dead and beyond harm he is still nervous, convinced that he has faltered somewhere along the line. Tormenting himself incessantly, he pays scant attention to what is going on around him, neither old friends nor incoming, modern arrivals register much in his mind. But one day a snippet of conversation seems to break through his inner fog. “That’s really him?” asks one of the impressionable listeners. X sits through the whole litany of legendary deeds, wishing that his own ears were likewise plugged. All at once the darkness of the underworld is illuminated for him, although in the worst possible way. His eyes are opened and he is finally able to see the tragic role in which he has been cast. He stares off into the emptiness that he recognizes as his own bitter fate, for now he knows that he will never have a place in the epics, that no one will ever play him on the stage - either in an opera or spoken role - and that his name will never become a synonym for anything. Michael Stein is a writer and journalist in the Czech Republic and has published short stories and journalism with a number of European and American magazines. He runs a website on Central European writing called Literalab and has written for literary journals such as Asymptote, Absinthe: New European Writing and the The Review of Contemporary Fiction. He is an editor at the Prague-based journal B O D Y and runs the Saturday European Fiction series. His own fiction has been published in The Missing Slate, Drunken Boat and McSweeney's among other magazines. 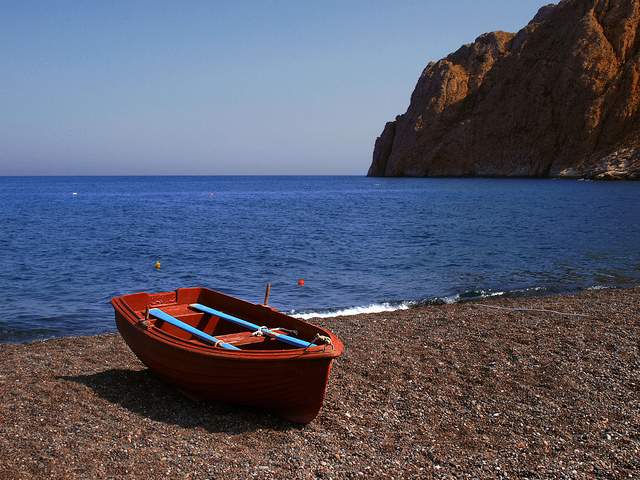 Image: "Boat at Kamari beach, Santorini, Greece" by Eric Hossinger.